luxuryhotelbreaks gift vouchers are an excellent way to motivate and reward people within your organisation. Allow the recipient to choose their perfect luxury hotel break. Excellent range of hotel breaks to choose from. Much more imaginative than just a financial reward! 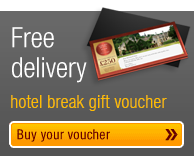 luxuryhotelbreaks gift vouchers are easy to order and great to give. You can purchase now online for as little as £50 or up to £1,000. Alternatively, contact us for larger orders. You can take advantage of the following discounts for block bookings. Save 3% on orders of £5,000 and over. Save 5% on orders of £10,000 and over. Save 7.5% on orders of £20,000 and over. Telephone - call us on 0333 2125 594 and we can help you organise your corporate vouchers.